Mixture Annual Summerflowers Semi-dwarf Maxi-Pack. Contains 125 gram, suitable for about 125 m². This mixture contains 50% dead buckweat to ensure you will not sow to thick and is also a green manuring. 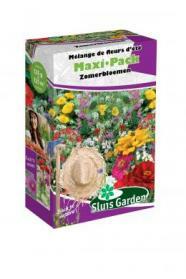 Contains: Antirrhinum, Calendula, Cosmos, Dahlia, Zinnia, Delphinium, Tagetes, Nigella, Lavatera, Penstemon etc.